I spent this past summer in Shanghai doing an internship, exploring the city, and just bumming around a bit. Shanghai, as I soon found out, has always been a mix of old and new. You could find old men crowded around an intense game of Chinese chess, a crowd of fanny pack-toting tourists, a hip and trendy Starbucks coffee shop, and a local with his pushcart selling meat skewers all on the same street. Louis Vuitton? Check. Fake eggs at a local market? (I’m not kidding) Check. Authentic Italian thin-crust pizza? Check. You get the idea. 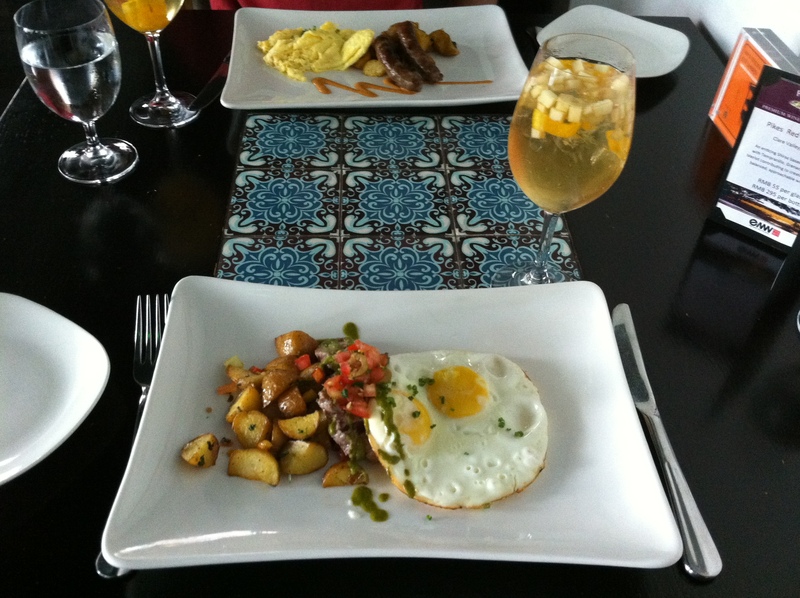 On one of my gastronomical explorations with one of my friends, we went to a Mexican brunch place called “Maya”. Boasting a “brunch menu below 50 RMB” on Sundays, this offer was a steal. While perusing the menu, the drinks list naturally caught my eye (yes, even on a Sunday morning). Bellini! Mimosa! And then Sangria! My God, people. This was not the first time I’d been to brunch, so I’m not sure why the idea of having a little bit of drank with Sunday brunch was such a novelty (Oh right, I know why, it’s because I live in America). So to do my first real brunch justice, we ordered white wine Sangria. Our Sangria arrives. Condensation forms around the wine glasses from the ever-present humidity. Ice cubes bob amongst the fruity bits and pulpy pods of lemon, orange and grapefruit. Bubbles fizz around the edges from the added Perrier. To use my native, regional Bay Area, proverbial term… it was “hella” good. For those of you who are not acquainted with the jargon: it was the bomb dot com, it buttered my toast, etc. The Sangria was refreshing, simple and absolutely tasty. Better yet, when I was done sipping on the bubbly wine, there was still floating fruit to fish out! Double whammy. Fast forward to a week later… my friend who is leaving Shanghai mentions two bottles of wine that he forgot to give to his boss as a going-away present. My mind whirs a little, and then I give him the look. I give him the upward shift of the eyebrows, a subtle smirk indicative of mooching, and the “you know what’s up” expression all in one go. He takes a second to process my meaning. We all know how that one ended up. Cut lemons into slices. Skin the kiwis (I had no idea how to do this, so check it out) and similarly slice. Peel and seed the lychee. Make sure to crush the lychee so the inner pulp becomes exposed (which releases juices). Finely dice the apples and pears. Place all fruit in a pitcher or bowl and add wine and juices. 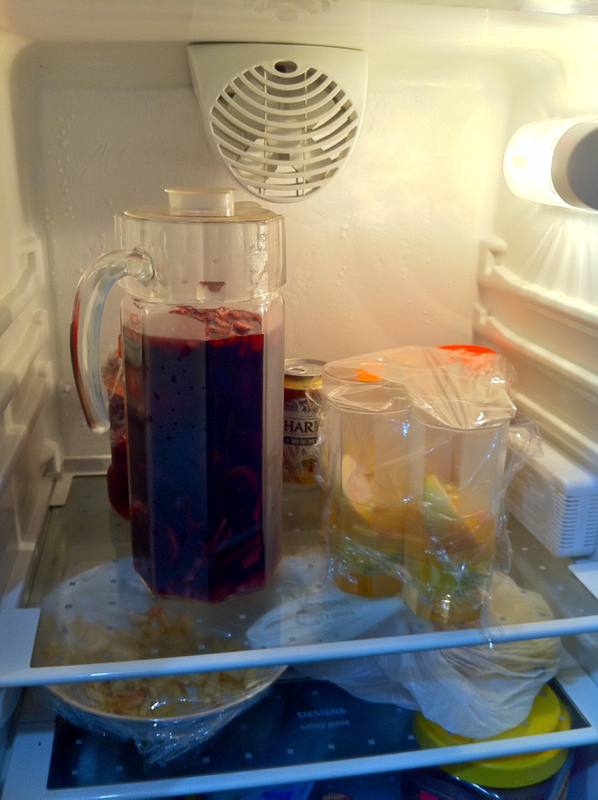 Allow Sangria to marinate in the refrigerator for at least 4 hours. Overnight is best. Add sparkling water to taste right before serving. Serves 5-6. Note: You can use any kind of fruit. Play around with the recipe and be creative. For red wine Sangrias, all kinds of berries work very well. For white wine, grapefruit, mango and watermelon would make great additions. So whether you’re in need of a summer throwback or just have some leftover wine that your friend forgot to give their boss that you can mooch off of… Sangria’s your go-to!